Having lost to Toledo in the 1967 Turner Cup Finals, the Komets slipped to fourth place in '67-68. While Muskegon ran away with first place, the battle for the second-fifth slots was hotly contested. Fort Wayne finished 30-29-13, their 73 points one ahead of Toledo and just five behind second place Dayton. The Komets were also in fourth place in offense, scoring 282 times that year. Fort Wayne legend Len Thornson led the team with 38 goals and 97 points. Three others, Bob Baird, Randy Gates and Merv Dubchak, joined Thornson in the 30+ goal club. Three others scored at least 20 goals. The Komets had the second-best defense in the IHL that season, allowing just 272 goals. Fort Wayne used three different goaltenders that year. Robbie Irons, who would go on to a long career with the Komets, played in the majority of the games (43), with Jerry Randall getting the nod in 35. Pete Neukomm played just one game in net that season. The Komets barely clinched the last playoff spot, only one point ahead of fifth place (and defending champ) Toledo. They faced the Dayton Gems in Round One. There would be no return to the Turner Cup Finals, as the Gems polished off the Komets in six games, winning the clincher at Fort Wayne, 3-2 in overtime. 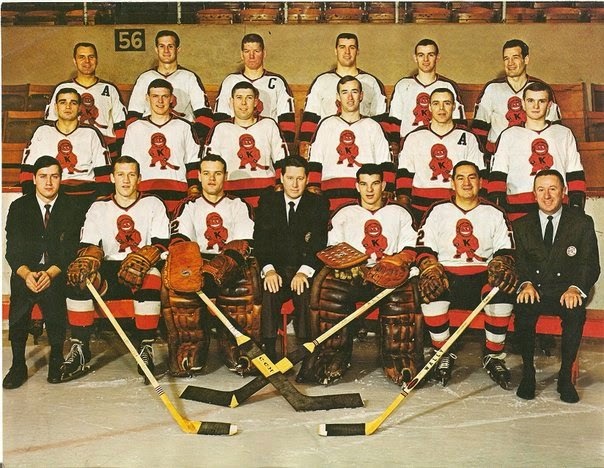 The Muskegon Mohawks would go on to win the Cup in five games over Dayton. First of all, this program was scanned horizontally, since it has a team picture on the front. Pretty small program, only 19 pages. There are short bios about members of the Fort Wayne press, and an article by Ken Ullyot. Local ads include Penguin Point Drive-In ("For Those Who Care and Little Time to Spare"), Yankee Drummer Restaurant and Atz Ice Cream Shoppe. There are also team photos of the '66-67 Komets as well as the midget and Pepsi Komets. In short, a small and to-the-point program.